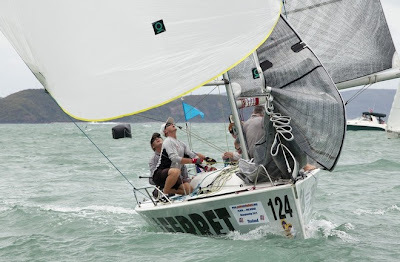 The Ferret powered by Easy Tiger Racing has claimed victory in the Platu Coronation Cup at Top Of The Gulf Regatta. The Sydney team led by Skipper Chris Way with Peter Winter (tactics), Tom Spithill (main), Peter Gregg (trim) and Mal Clark (bow) won on a count back after organisers were forced to abandon racing today due to the lack of wind. “There was absolutely no wind whatsoever today and with the forecast predicting between three to five knots it was very unlikely we were going to get any racing in,” Skipper Chris Way said. Yesterday Way and his crew were penalised for an OCS in the first race and although they finished second they were awarded six points due to errors made by the race committee. After two more races they tied with Nataya and were keen to settle the score today on the water fair and square. But it was not to be. “It’s pretty disappointing when it happens this way. Today we were pumped with adrenalin after another Go Kart session last night. Our game plan was to stay cool and sail hard, however there’s not much you can do about it when the wind doesn’t come to the party,” he explained. “We were tied on equal scores with Rolf Heemskerk's Nataya and with all finishes identical the winner of the last race is declared the overall winner and that was us. We are absolutely ecstatic and over the moon with joy. Way added that this victory is all the more sweeter after having missed out on podium finishes at both the Farr 40s (lost protest) and Melges 32s (gear failure while leading overall) Australian Championships earlier this year.